Electron Beam Leads The Charge For Food Safe Inks — Energy Sciences, Inc.
As the global population grows by 80 million people every year, it's no surprise that the food packaging industry is growing as well. According to a recent Smithers Pira report, the food packaging market is on track to grow faster than the packaging market as a whole. With this increase comes an ever growing responsibility of packaging manufacturers to make sure their product can safely hold all foods and beverages. Food-safe inks are an important part of this, and electron beam technology is at the forefront of using inks that completely guarantee food safety. As stated by the Smithers Pira report, titled "The Future of Printing for Food Packaging to 2021", the food packaging market is expected to grow to $221 billion by the end of 2016. The projected compound annual growth rate (CAGR) of the sector is forecasted to be 3.0% by 2021. With a large growth like this, an expansion of safety controls is necessary to assure packaging does not contaminate the food it holds. Governmental and brand requirements for food-safe inks are tightening, largely in response to public outcry over inks and chemicals being rubbed off of packaging and onto your food. A 2014 study brought to light 175 chemicals used in food contact materials that were "chemicals of concern," many of which are carcinogenic, mutagenic, or reprotoxic. The increased concern for food packaging safety has led to increased governmental regulation and companies turning to proven and safe printing methods. The report outlines legislation and brand requirements in place to keep to consumers safe, key growth areas, and an in-depth analysis of key vendor strategies. It also uses primary research consisting of expert interviews, printing and packaging reports, forecasts, and government data to establish an accurate prediction. A full version of the report and its findings can be purchased on the Smithers Pira website. As an FDA approved process, ebeam technology is relied on by the food packaging industry to ensure safe packaging for consumers. EB chemistry is approved for direct contact with all food types, per Code of Federal Regulations Title 21. EB coating is made of 100% solids, with no volatile organic compounds, no solvents, and no evaporation. Besides being safe for contact with food, EB products have a higher quality finish than other alternatives. An EB finish is high rub, scuff, and chemical resistant. A product cured by electron beam technology also looks great. Compare the two images below as an example. The image on top is printed using a water-based method and the image on the bottom is printed using EB technology. 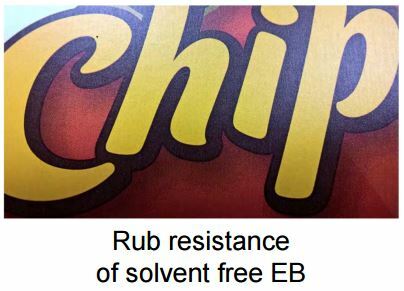 The difference between the two is clear; EB does a superior curing job and gives the product attributes that retain its attractiveness from the print site to the supermarket shelf. Electron beam curing has been a proven food-safe packaging process for many years. As your site grows to accommodate the growing food packaging industry and ensure your product is safe, let EB take away some of the guesswork that comes with other inks and chemicals. For more information on EB applications in food packaging, click the button below to download PepsiCo's GelFlex Ink presentation from Radtech 2016.